Translation Tribulations: Do proZtitutes make translation easier than ever? This took him to the site of a service provider in India offering to convert and machine translate a variety of file types, creating formatted output, and doing OCR conversion for what some might assume were "reasonable" prices. 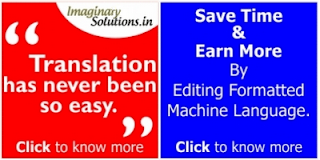 To convert and machine translate about three scanned pages of double-spaced, typed text (about 1000 words) costs a mere USD 7. Ramalamadingdong, what a deal. Let's forget for a moment that OCR is often a no-brainer job with professional or even second-tier OCR software, and Google Translate and other garbage engines are free or nearly so, and let's not even think about potential issues of confidentiality that too many forget to consider. And then, of course, one can ignore the fact that it sometimes helps to understand the language of the text you are converting if there are decisions to be made about blocks and sequences or corrections to deal with. I'm not sure I understand the concern with Ze Zite's reputation; in many eyes it has been disreputable for some time now. That ProZ is now advertising services for low-end garbage services like this is hardly much of an insult on top of the record of its past injuries. This is also entirely consistent with phoax at the commercial portal "certifying" bottomscraper agencies and other amusing stunts. I don't think he has to worry much about Ze Zite trashing his reputation by association. I'm sure, like any good businessperson, he has developed a number of better channels for acquisition and collaboration and prefers to work with professionals. Some time ago, I wrote about discussions of a "translator's dream site". I had intended to follow this up with a review of various alternatives I have seen develop in recent years. I don't believe that there is one ideal "site" for all needs. Where you troll for quickie assignments might not be where you feel like a serious technical discussion about your CAT tools, and I hope it's not where you would discuss truly sensitive business matters. Abandoning the illusion that a for-profit portal with a history of exploitation and pandering to interests at odds with those of freelance translators and other small service providers is a good first step. I've found that my personal mix of networking at professional conferences and trade fairs of interest to me, Twitter, Facebook groups like Networking Translators (where a lot of German peers seem to congregate in a chaotic cluster), the forum for BDÜ members and the private forum Stridonium give me a richer, more diverse professional experience than one typically enjoys with PrAdZ. If you want to support a Zite willing to proZtitute itself with any and all promiscuous promoters of Gargled Translation (however well formatted), be my guest. You are free to choose your market segment within the limits of your abilities. But should you opt for the compelling deal from "Imaginary Solutions" to machine translate your texts, I'm sure your competitors will have kind words for you. Claudio, I think PrAdZ made it to Hell under its own steam, and the crew has been engaged in digging new fire pits to incinerate quality and professional ethics since then. I keep track of things there only occasionally now, as aside from letting friends and colleagues know when there's a group buy of interest, there really is little there to attract useful attention. Once competent moderation was eliminated in the forums and site policies became an arbitrary and irrational juggling act by the junta in Argentina - and reputable outsourcers began to avoid posting on the site due to the declining quality of registrants and the desire not to be associated with third-world bottomfeeders - there's little to do there but organize the occasional powwow (which I expect will happen by another means eventually - the last big powwow in Berlin was mostly about better places for networking) and roll one's eyes at the daily queries from newbies wanting to know how to write an EU VAT invoice for Switzerland or the USA. Thank you for "OCR is often a no-brainer job", I am working as a Desktop Publisher, beside translator, and that's an offensive statement. Try to make an OCR from a book with 300 pages, and arrange the layout, and after please tell that. Let's have a look at the English word "often". What does it imply in the sentence you quote? Would the case you describe - conversion of a 300 page book (from the book itself, I presume, as you don't actually say - or are we talking about a scan of a 300 year old volume from a national library) describe a typical OCR conversion a translator might want to do? What percentage of your OCR jobs do such conversions (let's be generous and say only 100 pages) constitute? If you do this a lot, you might want to have a look at some of the lovely book scanners that will be on display at the DMS trade show in Stuttgart, Germany starting tomorrow. They can certainly speed up the process of scanning at least. As for conversion from an electronic file, scanned or otherwise, I've done that. It involves time, but complexity is seldom related to quantity. I've seen single page flyers that are more challenging than 200 pages of a book text. A typical conversion example for me might be something like a chapter in a report I translated a while back, which involved the statistics underlying premium calculation for nuclear power plant insurance. An ugly source text, littered with formulae, some 10,000 words as I recall, or a bit less. I'll spare you the details of how I got through that one and the insight that made the complex formulae not a problem, but the source was converted and "laid out" in a manner fit for purpose in about half an hour. OK, I'll confess to having used my brain that day, but for scans of newspaper or magazine articles, patents and brochures that isn't often the case. And I wonder if our Imaginary Service Provider (the proZtitute described above) would have taken the time to format all the chemical formulae in the patent claims I did this morning. Perhaps, but somehow I doubt it. you know what? agree, 1 page or 1000 never mind, I am working daily with OCRs , and not in my native language or languages that I know. I agree with what you said about that service, and rates, and everything, but think before you say something. I am working with OCRs over 4 years, and none of them had useless text. And yes...I had poor scans, even after some invoices or bills. Even in Chinese or Japanese. And as I said, I agree with what you said, but don't make a service to look useless in translation, in special because some of us are trying to make stupid scans reliable source formats for CAT tools. Indeed, especially if you don't know what you're doing. Understanding the source language is important to the quality factors you mention, but by your own admission, 0fc77ed8-1c5e-11e2-97c1-000f20980440, you often do not. So what's the point? OCR and text cleanup for the purpose you cite is discussed often enough, here and elsewhere. And with regard to tags, there are many ways to deal with that. Have a look at the keyword CodeZapper. I have had my doubts about ProZ fo a long time, but I have not (yet) reached the point where I would no longer renew my ProZ subscription. Having said that, the current state of translation and localization affairs (no recognition, low rates, often bad payment practices) makes me wonder how long this can go on. In an EU in which every farmer can obtain an EU grant or subsidy when there is too much or too little rain, it is about time that professional translators can obtain a subsidy to support them, if only to be able to reduce working weeks of 60-70 hours back to more normal levels of 40 or 50, AND have a decent income that reflects their educational en professional background, their professional development and their often very diverse knowledge required to translate or localize the material presented to them. By maintaining and allowing "professional" services like the one in your article, ProZ is quietly digging its own grave, much in the same way that the ridiculous Trados-based discounts introduced years ago by mostly the bigger LSPs are now taking their toll on these very same bigger LSPs. But the other side of the coin is this: as long as we, professional translators and localizers of long standing, cannot convince our 'colleagues' that they should not accept the ridiculously low rates often advertized, we ourselves are partially to blame. I disagree. 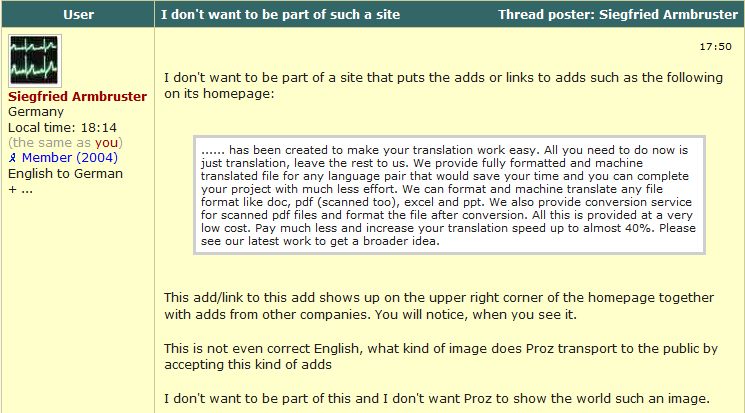 ProZ is not a disreputable site. You choose to look at the bad and call it that and then use absurd examples to justify your opinion. I choose to see it for what it really is, a professional networking site. It is not the start-all, end-all of the translation business so if you don't like it, forget it, but don't denigrate its worth or the worth of myself and thousands of other ProZ translators who are serious about translation. I have a right to be a translator just as much as you do. This is an offensive article based on either a bad experience, flawed judgment or both. I have responsible, professional clients that found me on Proz (that's right- they searched for me). They keep me working full-time and pay well. But, of course I can spell "ads". I am a paying member of the Proz site and it takes me a little over 1 working hour to pay for my yearly subscription. I think it's a great deal! Yes, the ProZ, once a cozy place, now is educating disrespect to the translators' job. And recently does it more outright than before. The Eastern winds.